The ascending aorta extends itself as the Arch of aorta at sternal angle level and it further extends itself as descending thoracic aorta at sternal angle. So the beginning and ending is at level of sternal angle. Its location is in the superior mediastinum. Near the left side of T4 vertebra , at the very beginning the arch is anteriorly located while at the termination it is posteriorly located. At manubrium sterni the arch reaches its summit (peak). The arch of aorta begins at the level of the right 2nd costal cartilage and runs upwards, backwards, and to the left, in front of the bifurcation of the trachea. 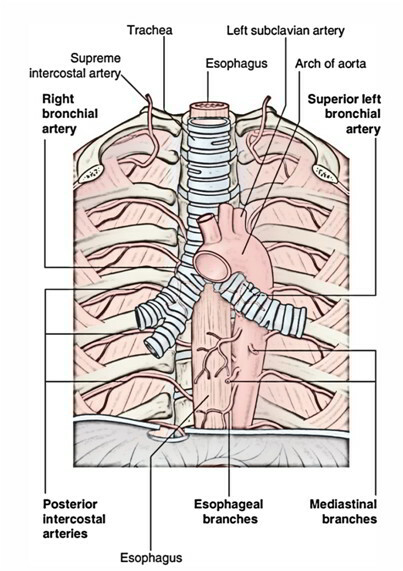 Having reached the back of the middle of the manubrium, it turns backwards and downwards behind the left bronchus up to the level of lower border of T4 vertebra where it continues as the descending thoracic aorta. A. The arch of aorta arches over the root of left lung. B. It begins and ends at the same level, i.e., at sternal angle. C. It begins anteriorly and ends posteriorly. C. Left recurrent laryngeal nerve. A. Left lung and pleura. D. Left cardiac nerves (i.e., superior cervical cardiac branch of left sympathetic chain and inferior cardiac branch of left vagus nerve). E. Left superior intercostal vein. B. Bifurcation of pulmonary trunk. D. Left recurrent laryngeal nerve. B. Left common carotid artery. Arch of aorta is related for 5 structures on every aspect. Occasionally, a fourth branch referred to as thyroideaima artery may originate from the arch of aorta. B. Left horn of aortic sac. C. Left fourth aortic arch artery. D. Left dorsal aorta (between the connection of the fourth aortic arch(artery) and 7th cervical intersegmental artery). In X-ray chest (PA view), the shadow of arch of aorta appears as small bulb-like projection in the upper end of the left margin of the cardiac shadow termed aortic knuckle. The aortic knuckle may become notable in old age because of undue folding of the arch caused by atherosclerosis. It’s congenital narrowing of the aorta just proximal or distal to the entrance of the ductus arteriosus. Accordingly it’s named preductal type and postductal type of coarctation of aorta, respectively. It probably takes place because of hyper involution of the ductus arteriosus. The ductus arteriosus is generally obliterated to create ligamentum arteriosum in post ductal type of coarctation of aorta. The collateral circulation develops between the branches of the subclavian arteries and those of descending aorta. A. There’s difference in the blood pressure of the upper and lower limbs (i.e., high blood pressure in upper limbs and low unrecordable blood pressure in the lower limbs). B. Notching of the lower borders of the ribs because of dilatation of engorged posterior intercostal arteries. In foetal life, pulmonary trunk is connected to the arch of aorta (just distal to the origin of left subclavian artery) by short wide channel termed ductus arteriosus. Normally, after beginning, it closes functionally inside a week and anatomically inside 4 to 12 weeks. The obliterated ductus arteriosus is named ligamentum arteriosum. Non-obliterated ductus arteriosus is referred to as patent ductus arteriosus. It’s the localized dilatation of the arch and causes compression of neighboring structures in the superior mediastinum producing mediastinal syndrome. The characteristic clinical sign in this condition is a tracheal-tuga that is a feeling of tugging sensation in the suprasternal notch.